More than a hundred people chanted these words as they walked for Indigenous rights in Winnipeg, situated on Treaty 1 land, on Sept. 23, 2017. The group met at Stephen Juba Park and walked 12 kilometres to the National Centre for Truth and Reconciliation in support of Bill C-262, a private member’s bill that, if passed, would begin the process of harmonizing Canada’s laws with the United Nations Declaration on the Rights of Indigenous Peoples (UNDRIP). The day began with a smudge, an Indigenous ritual of purification, and prayers of blessing for the walk. 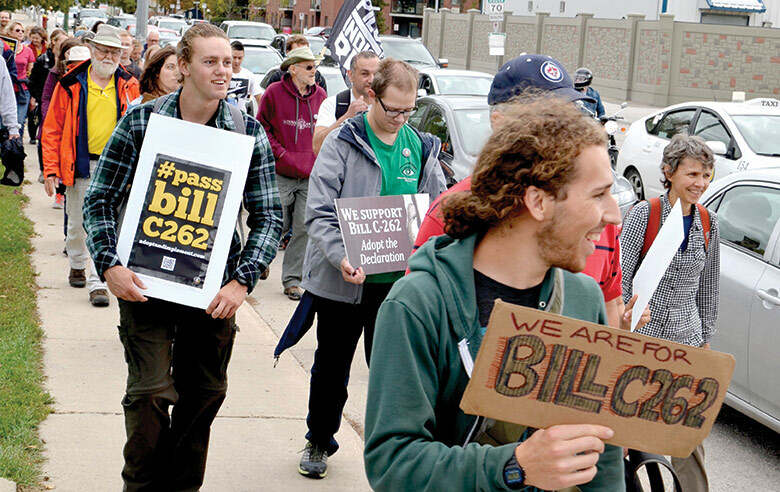 A banner proclaiming “We support Bill C-262” led the way as the group walked along busy streets to the drumbeat of an 87-year-old and the cheers of a 7-year-old. This is not the first time people have walked to advocate for Indigenous rights. This spring, Mennonite Church Canada and Indigenous Peoples Solidarity organized the Pilgrimage for Indigenous Rights (PfIR), a 600-kilometre march from Kitchener, Ont., to Ottawa, to engage churches in conversations around UNDRIP. Bill C-262 was introduced by NDP MP Romeo Saganash in April 2016, and is set for a second reading in October. This quickly approaching deadline spurred a flurry of action in Winnipeg in addition to the Sept. 23 walk. 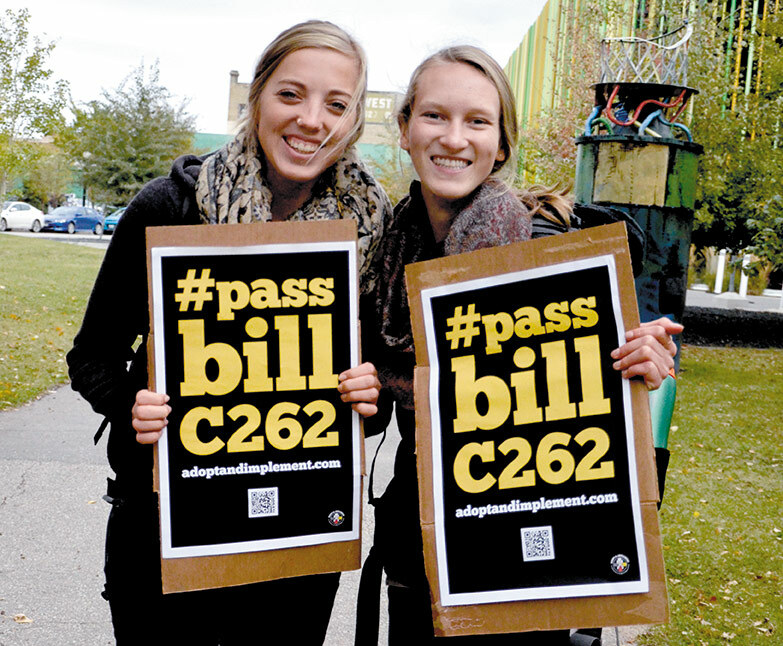 The same weekend, giant letters spelling out “#Pass Bill C-262” were emblazoned across the bridge at Canadian Mennonite University. “More and more Indigenous and non-indigenous Canadians are joining forces together, sending a clear message to the Trudeau government that it’s time to honour fundamental Indigenous human rights in this country,” said Leah Gazan, professor at the University of Winnipeg and Indigenous rights activist. Gazan was one of the speakers who addressed the gathering at the National Centre for Truth and Reconciliation, where the walk ended. Along with speakers like Michael Redhead Champagne, Gramma Shingoose and musician Leonard Sumner, Gazan reminded people that there is still a lot of work to do and urged them to keep walking the talk for Indigenous rights.